The jagged coastline and many streams conditioned the forming of numerous small and large beaches with sandbanks of fine sand and pebbles. There are around 20 beaches the total length of which is 9,000 meter. The natural forests of various Mediterranean vegetation directly near the sea line and rich springs of water give the freshness to the beaches of this rivièra. The sand can be warmed up to 50°C. 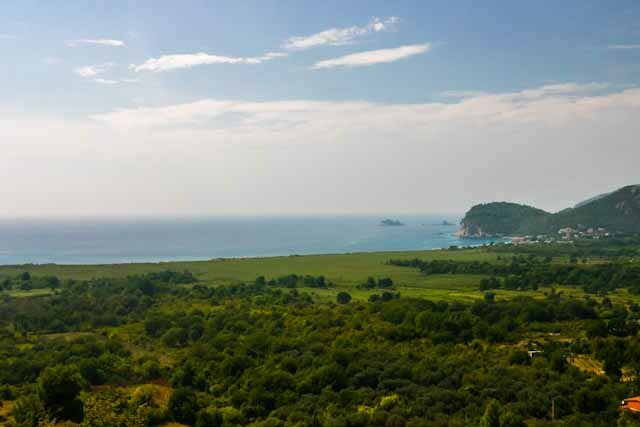 The valleys Veliki Pijesak and Mali Pijesak are situated at the south of the Bar district, 10 kilometer away from Bar towards Ulcinj. The beaches are protected natural reservations. They are covered with fine sand, as well as the sea bottom. Because of its geographical position, you can enjoy fantastic visions of sunset in the late afternoon. The beaches are about 600 meter long and a gravel road connects them with the main road. There is a weekend settlement among the old oak and olive trees in its background. Best accommodation in the vicinity of the Veliki Pijesak plaža beach. Copacabana Lux Apartments – Located in Ulcinj at the Veliki plaža, Copacabana Lux Apartments provides sea views and free WiFi. All units feature a private bathroom and have air conditioning, a flat-screen TV and a microwave. Some units have a terrace and/or balcony. A continental breakfast is served each morning at the property. At the campsite you will find a restaurant serving Mediterranean cuisine. A Vegetarian option can also be requested. Copacabana Lux Apartments offers a terrace. A private beach area is available on site. Location – Veliki Pijesak plaža. Facilities : Beachfront, Private beach area, Terrace, Massage (Additional charge), Pets allowed, Restaurant (à la carte and buffet), Bar, Free Wi-Fi, Free parking, Daily maid service, Private check-in/check-out, Meeting/banquet facilities, Special diet menus (on request). The Canj plaža, or Pearl beach, is one of the most beautiful ones on the Montenegrin coast. This beach is divided into two smaller beaches by a mountain cape. It is covered with layers of fine and colorful sand as for the sea bottom with round rocky pebbles, after which it was named. The total length of both the beaches is 1,800 meter with the capacity of 9,000 people. There are hotels and rest homes, restaurants and cafes, surrounded by pines and cypresses, as well as other Mediterranean vegetation in its background. Best accommodation in the vicinity of the Canj plaža beach. Guesthouse Apartments Zec – This property is a 1 minute walk from the beach. Apartments Zec is located 700 meter from the center of Čanj and features an on-site restaurant with sea views. It offers air-conditioned accommodation with a terrace or a patio and free Wi-Fi. All accommodation units will provide you with satellite TV, a fridge and a private bathroom with a hairdryer and towels. Some accommodation units come with a fully equipped kitchen or a kitchenette with a dining area. At Apartmani Zec you will find a garden and a sun terrace. Sun loungers and parasols on the beach are at guests’s disposal free of charge. Laundry and ironing services are available at a surcharge. Facilities : Outdoor furniture, Beachfront, Sun terrace, Private beach area, Garden, Sun loungers or beach chairs, Pets allowed, On-site coffee house, Restaurant (à la carte), Free parking, Free Wi-Fi, Airport shuttle (additional charge), Car hire, Ironing service (Additional charge), Laundry (Additional charge), Air conditioning. The Maljevik valley, together with the adjacent inlet from which it is separated with the Klicevac cape, is a small rocky beach between Canj and Sutomore. It is about 100 meter long and the sea water is extraordinary clean. The Black Cape is nearby. In its underwater part there are many significant archeological excavations – a true heaven for the researchers of the sea depth. Best accommodation in the vicinity of the Maljevik plaža beach. Apartments Vila Dusan – Located 1.2 km from the Maljevik beach, Apartments Vila Dusan is a self-catering accommodation located in Sutomore. Free WiFi access is available. The apartment will provide you with a TV, air conditioning and a balcony. There is a full kitchen with a refrigerator and kitchenware. Featuring a shower, the private bathroom also comes with a hairdryer and free toiletries. The mountains and sea can be viewed from the apartment. At Apartments Vila Dusan you will find barbecue facilities and free parking. If you feel like exploring the area, the property is 3.5 km from the old town of Haj-Nehaj. Facilities : BBQ facilities, Air conditioning, Free Wi-Fi, Free parking, Airport shuttle (additional charge). The Crvena or Red Beach is situated in an inlet between Sutomore and Bar. It was named after the extreme red color of the sand or stone pebbles which cover the beach and the sea bottom. It is 1,000 meter long with a dense pine forest in its background. It is very distinctive because of the unusual harmony of the colors of the sea, red sand and pine forest. It is a favorite bathing beach of the local people. There is a legend which says, that the nymphs of Nereida used to gather at the top of the high cliff over the beach and comb their hair with coral combs. Their laughter and singing could be heard far away from there, but nobody could talk about it, because if they did, they would become mute. Best accommodation in the vicinity of the Crvena plaža beach. Crvena Plaza Beach Apartments – Crvena Plaza Beach Apartments offers accommodation with free WiFi and access to a garden. You can enjoy refreshments in the on-site bar with a terrace. Stairs from the property garden lead directly to the beach. Each unit comes with with a terrace, a flat-screen TV with satellite channels, a seating area, a well-fitted kitchen and a private bathroom with shower and free toiletries. Some units feature a balcony and/or patio. There is a restaurant 200 m away, which specialises in Mediterranean cuisine. A car rental service is available at Crvena Plaza Beach Apartments. Facilities : Beachfront, Outdoor furniture, Terrace, Massage (Additional charge), Garden, Bar, Restaurant, Free Wi-Fi, Free parking, Baby safety gates, Windsurfing Off-site (Additional charge), Diving (Additional charge), Fishing Off-site (Additional charge), Airport shuttle (additional charge), Car hire. The Kraljica or Queen’s beach is situated in the vicinity of Canj, at its very north. This small but attractive beach can be approached only from the sea. It is surronded with sediment cliffs. 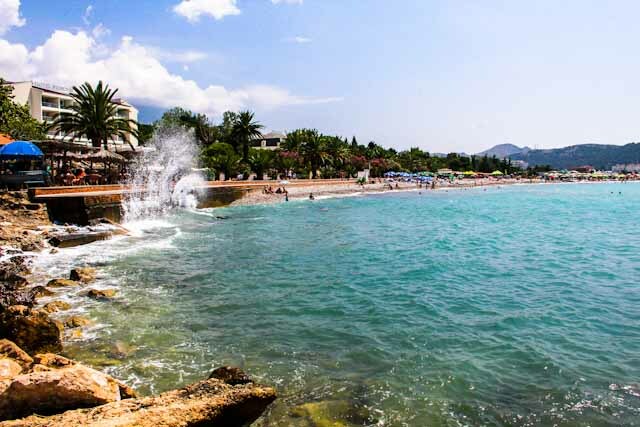 Because of its environment, fine sand and crystal clean sea water, it was the favorite beach of queen Milena when coming to the Topolica castle. Best accommodation in the vicinity of the Kraljica plaža beach. The city beach of Sutomore is in the vicinity of Bar. It is 1,250 meter long and the Golden beach, which is 850 meter long, is next to it. Both of them are sandy and golden, which makes this part of the coast extremely beautiful. Being on the beach alleviates the sufferings of people with rheumatic problems. There are hotels and private apartment-complexes, restaurants and cafes, with the dense forest of pines and cypresses in their background. Three centuries ago Venetian countesses gladly came here for a swim. Best accommodation in the vicinity of the Sutomore plaža beach. Hotel Sea Fort – This property is located at the beach. Enjoying a seafront position in Sutomore, Apartments Sea Fort Sutomore offers an on-site restaurant and free WiFi access in the entire property. Each modern-style apartment is fully equipped and provides a balcony or terrace with seating area. Decorated in bright colours, all apartments have a living room with a sofa and a flat-screen TV, as well as a kitchen. Private bathroom comes with a bath or shower and a hairdryer. At Sea Fort Sutomore you will find a mini-market, in addition to a games room and a children’s playground. The property has a 24-hour reception. A meeting hall for 50 people is also provided. Facilities : Beachfront, Terrace, Spa/wellness packages (Additional charge), Restaurant (à la carte), Room service, Free Wi-Fi, Secured parking (Additional charge), Ironing service (Additional charge), Laundry (Additional charge), Car hire, Airport shuttle (additional charge). This is a rocky beach, about 1,000 meter long next to the Red beach. It is covered with rocky pebbles and its background is overgrown with Mediterranean vegetation and pine forest. It was named after the custom to soak Spanish broom, a low Mediterranean shrub with beautiful yellow flowers, in the water as to become soft, which is how it was prepared for weaving. Best accommodation in the vicinity of the Zukotrljica plaža beach. Gulnara Apartment – Featuring a sauna, Gulnara Apartment is situated in Sutomore. The property, housed in a building dating from 2011, provides free WiFi. This apartment is fitted with 2 bedrooms, a living room and a fully equipped kitchen with a dishwasher and a microwave. A flat-screen TV is offered. The property has a hot tub and a sauna. This property offers BBQ facilities. Facilities : Beachfront, Outdoor furniture, Terrace, BBQ facilities, Hot tub/jacuzzi, Sauna, Free parking, Free Wi-Fi, Private entrance, Pets allowed, Ironing Facilities, Pets allowed, Sea view, Mountain view, Beach, Car hire, Grocery deliveries (Additional charge), Shuttle service (additional charge), Daily maid service (Additional charge). The Murici Beach is the biggest one at the Montenegrin part of the Skadarsko Jezero. It is situated beneath the village Donji Murici on the north-west coast of the lake. This sandy beach is 600 meter long and 7 meter wide, with a shallow sandy bottom that goes far into the lake. There is a well of clean and cold water at the very beach, and a dense forest of old oak and chestnut trees in its background. Murici is a favorite picnic place where tourists can enjoy the specialties of the lake, carp and eel, and the beautiful scenery which is rich with a unique flora and fauna. The Skadarsko Jezero is one of the national parks in Montenegro. Best accommodation in the vicinity of the Murici plaža beach. B&B Skadar Lake Murici – B & B Skadar Lake Murici offers a garden. This 3-star bed and breakfast offers air-conditioned rooms with a private bathroom. The bed and breakfast has a terrace and a 24-hour front desk. At the bed and breakfast, each room includes a terrace with mountain views. All guests can use free Wi-Fi and some rooms have a balcony. All rooms have a wardrobe. A continental breakfast is served every morning at the property. Facilities : Balcony, Garden, Terrace, Lake view, 24-Hour Front Desk, Secured parking, Beachfront, Sun loungers or beach chairs, Canoeing (surcharge). 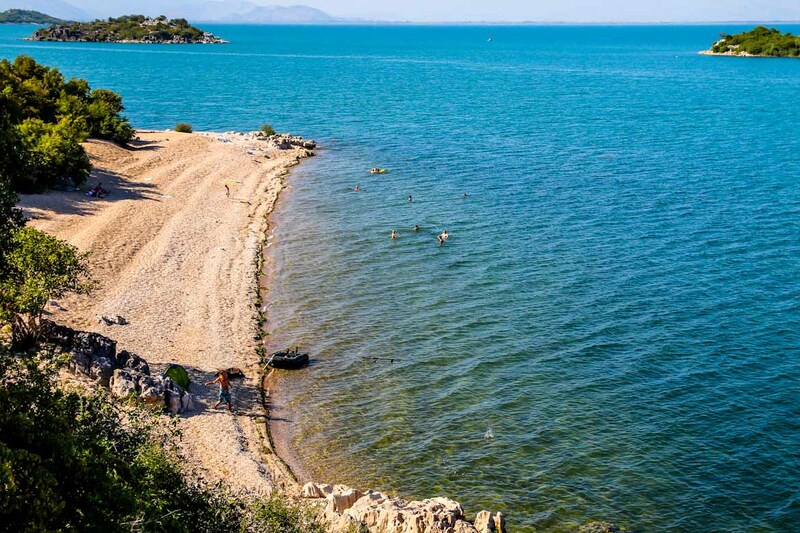 Many people say that this 800 meter long beach is a real treasure because there is a path lined by olive trees going up to the high way and further on. It is famous for its beauty, sunny hours and clean sea water, in which drinking water springs, which mixes with the salt water and creates thus unusual light shades of turquoise. Utjeha Beach is situated between Bar and Ulcinj and consists of rocky pebbles. Best accommodation in the vicinity of the Utjeha plaža beach. Apartments Lux Lukic – Apartments Lux Lukic is uniquely situated just 30 meters from the sea, in Utjeha, Montenegro. Free Wi-Fi and free parking are available, and the property also has a private beach. All apartments have modern furnishings and include a seating area, a TV and a fully equipped kitchenette. The private bathroom has a shower and a balcony with sea views. A laundry service is available, as well as a breakfast on request. The nearest restaurant is 50 meters away and serves international cuisine. There is also a supermarket 50 meters away. Facilities : Private beach, Balcony, Terrace, Private entrance, Airport shuttle (surcharge), Secured parking, Sea view, Free Wi-Fi Internet Access Included.